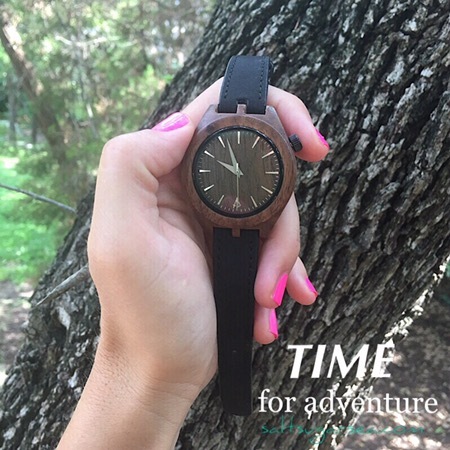 A wooden watch review for adventure seekers, and adventure dreamers alike. 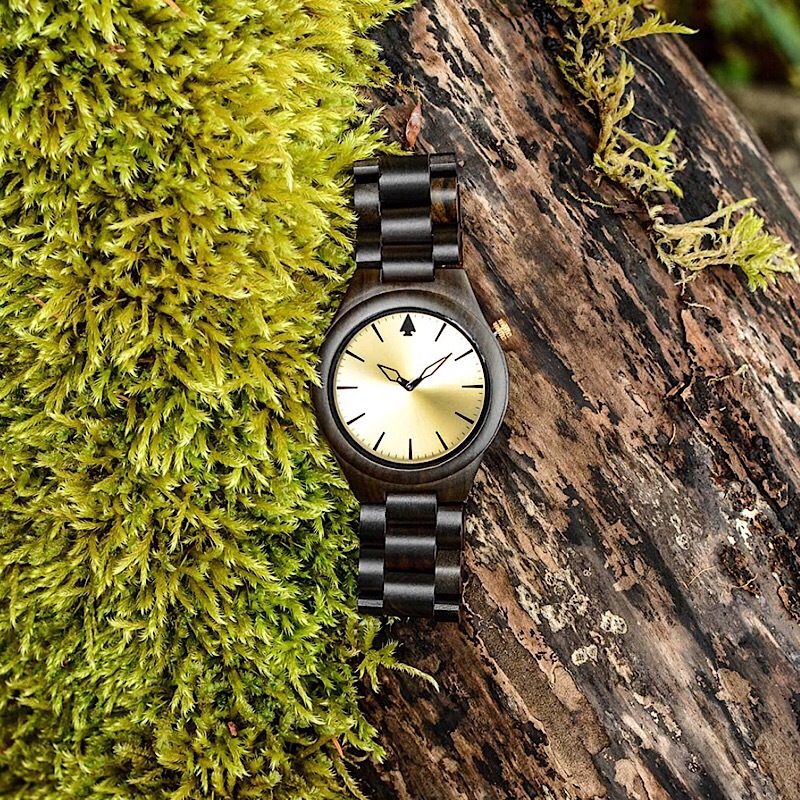 This watch is designed to be worn in both the wild, and in civilization. Constructed of light woods, durable leather and timeless stainless steel. Apache Pine watches are made to ride along on any of your life’s adventures. The company was brought together by a group of friends with exploration roots from the Rocky Mountains of Idaho. Apache Pine was created as a reminder to explore more, and bring nature into daily lives. 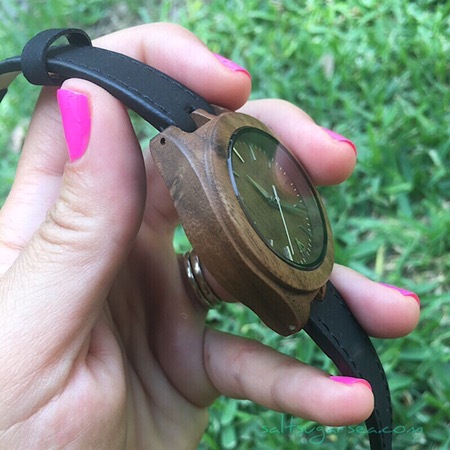 These natural wood watches allow you to take a piece of the outdoors, inside. 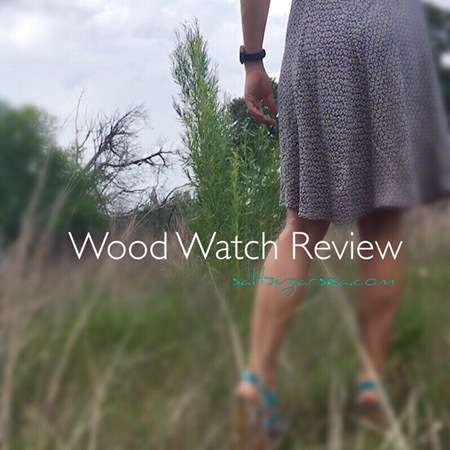 This is a wooden watch review of Apache Pine’s Sqwatch model. All images were photographed in natural outdoor light to capture the true nature of the watch. 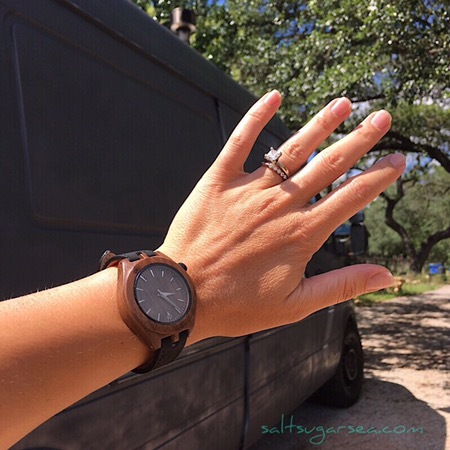 Over the last couple weeks I have worn the Sqwatch Wooden Watch through the elements of our typical life’s adventures. Including (but not limited to) traveling the #vanlife, camping, dinning out, hiking trails, to the lake, carrying a baby, and while cooking. I’ve bumped it, splashed it, played with the pup while wearing it, and baby has covered it in sticky fingers. I am happy to report that this wood watch is still surviving quite nicely. As the wood in each watch is cut directly from nature, no two timepieces will ever be completely identical. Different tints and imperfections in the wood will show through each individual watch. While the surface is completely smooth, my particular watch holds a unique darker coloration on the top, and a small ocean-like swirl on the side. The Sqwatch’s true wood roots show through the shiny stained finish. 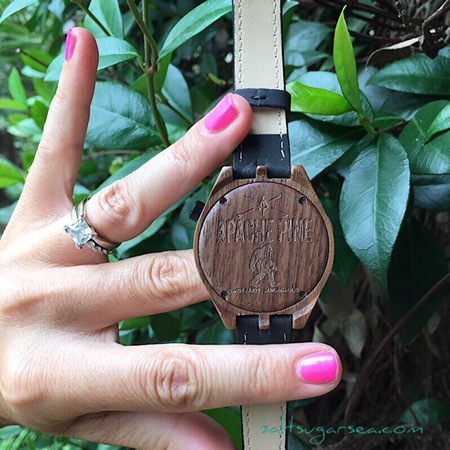 The Apache Pine Sqwatch is a minimalist style wooden watch, with a clean design that is one of simplicity and of class. 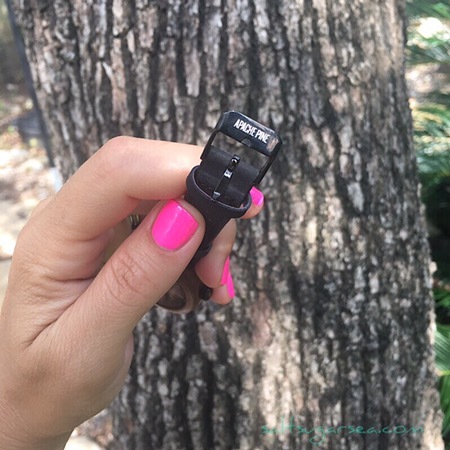 There are three notable details that stand out on the Sqwatch Watch. Each detail adds a little something extra to this wood watch. Especially #3. I wonder if this particular detail was added to the Squatch to be reminiscent of a back country adventure? A detail that made me thinking back to hunting and hiking trips, when I was a kid, and we would carve our names in a tree. The Squatch Watch is reasonably affordable for a wood watch, with a current listed price of $189 USD. “Splash Resistance” is listed in the details of this watch, which suggests to me the case would hold some protection. However, there is no warranty coverage should any moisture damage occur. No swimming with this one! 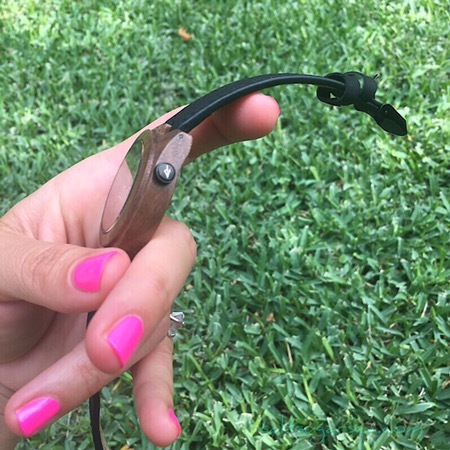 The Sqwatch has, so far, withstood the test of our adventure lifestyle, proving to be quite durable. The only critique I have is, I wish a waterproof model was available. This would be great for all of us true dirty adventurers who like to spontaneously dive into the water. Apache Pine is TIME for adventure (hehe). Get one for free! Enter to Win Apache Pine’s newest Watch, The Arrow. 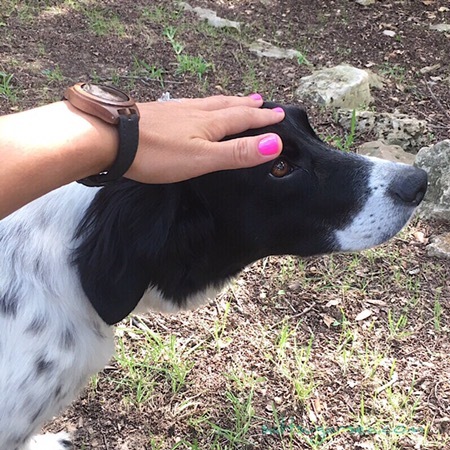 This looks like a pretty neat watch and I like that it appears to be “pet-your-pet” friendly too.